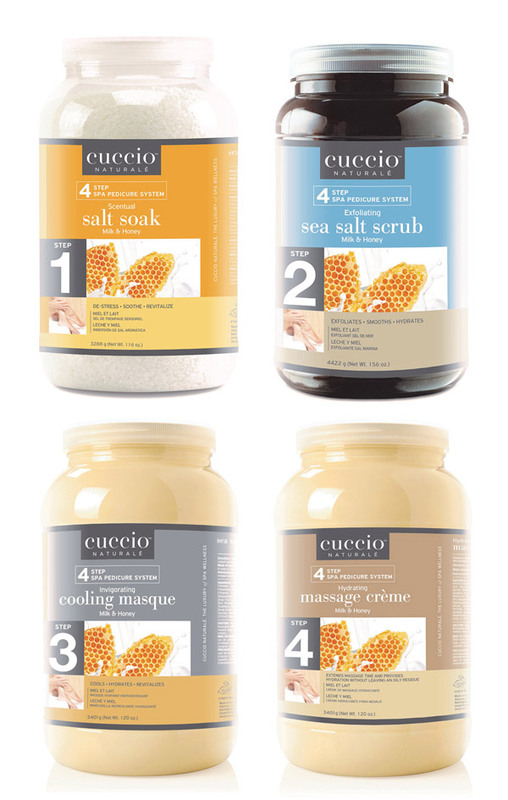 Alleviate the stress of choosing pedicure products that will coordinate together, and start using the 4-Step Cuccio Milk & Honey Pedicure System for high-quality, relaxing pedicures! Easy, Yet Luxurious Foot Bath - Offering a luxurious foot soak treatment has never been easier. The Cuccio Spa Pedicure Salt Soak creates a stress-free pedicure experience clients will keep coming back for. Soft, Moisturized Skin: Pedicure spa salts are made using a blend of all-natural honey that soothes and moisturizes skin. Quickly Removes Dead Skin: These foot salts soften and break down dead skin cells for fast, easy removal. Sea salts leave skin revitalized and clean, and ready for the next step in your pedicure regimen. Soft Beautiful Feet Now Easy to Achieve - Get soft, touchable feet with the Cuccio Pedicure Foot Scrub. A gentle yet effective foot exfoliator treatment that removes dead skin without harsh scrubbing. Exfoliates Flawlessly: Made using all-natural honey, Cuccio pedicure scrub offers a double exfoliation process that smoothes skin until it's flawless. Hydrated & Rested Feet - This Cuccio Pedicure Foot Mask gives skin complete hydration while invigorating tired feet through a cooling effect. Touchably Smooth Feet: Pedicure mask has all natural milk & honey that effectively soothes and refreshes dry skin. Foot Massages Made More Rewarding - The Cuccio Foot Massage Cream is a moisture-rich formula that not only treats dry skin, but helps your massage technique be more effective and works the product into the skin. All-Natural Milk & Honey: Providing amazingly soft feet, this foot massage lotion is made from all-natural milk & honey that nourishes the skin with vital nutrients.